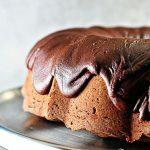 Chocolate Pound Cake makes a delicious pound cake you'll love to serve for special occasions, celebrations, or just because. Get this family-favorite chocolate pound cake recipe to share with your family. Preheat oven to 325 degrees. Prepare bundt or tube pan and set aside. Cream together butter, cream cheese and sugar til fluffy. Add eggs one at a time. Add flour, cocoa powder, salt and vanilla. Bake until golden brown and skewer inserted into middle of cake comes out clean, about 1 and half hours.